Recently the name Andrew Sings….. has been cropping up quite a lot and I wondered who this is and what a strange stage name it is. Obviously a new entertainer, but in fact it is a duo – Andrew Tait and Glen King. 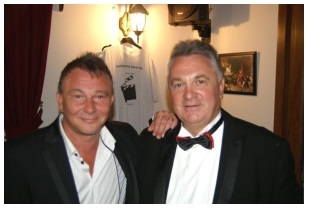 now very appropriate, as it is Andrew who does most of the singing and their aim is to give as much variety as they can so – Andrew Sings…..the Swinging 60’s, Andrew Sings…..The Rat Pack, Andrew Sings…..Tom & Engelbert, and so forth. This makes a lot of sense so now my question is answered. Glen also sings, sometimes solo and sometimes with Andrew as a duo but his main contribution is looking after the backing music and making sure the best possible reproduction is achieved and this he really likes doing. Glen said – Andrew is the singer, I like looking after the music. from Irthlingborough in Northamptonshire. Andrew was previously in Banking and Glen was in the Nursing profession. They have known each other for 23 years and decided to move to Turkey in 2008 to live in the sun, a country they had been visiting on holiday for 20 years. Andrew said he had never sung before except for the odd karaoke in the UK but had always had something at the back of his mind that he would like to sing. The opportunity came in Turkey when he and Glen agreed to help out a friend and sing at his bar in Didim called The Cavern. They were a huge success and from then on there was no looking back. Other bar and restaurant owners heard how good they were and so they started to do something they both enjoyed, entertaining. mplexes in the resorts of Altinkum, Didim and Calis Beach, Fethiye They felt that the resort environment was a little restrictive as they would be singing to the same audiences regularly in venues that were all close to each other, so they had to change their performances frequently. Andrew said the advantage was that he had to learn a huge amount of new songs, so between them they have a repertoire of over 250 popular songs. did not want to work illegally. They had been to North Cyprus on holiday from Turkey and liked the island and better still they were aware of a legal bone fide organisation, All Stars Agency Promotions, which had been set up for performers and with some help from the agency they managed to obtain a work permit and thus be able to continue in North Cyprus. They are both over the moon as to how this all came about with comparative ease and at last they can now perform with no worries. We asked Andrew and Glen about the type of songs they sing and were told that Andrew loves Swing but sings all sorts of genres from the 1940’s through to present day and Glen loves the 1980’s and sings mostly 80’s hits. So between them they can cover songs to suit all tastes and age groups, easy listening songs and songs to dance to. some very special meaning to them. They said most people can relate to songs which mean something to them from various events throughout their lives. We suggested that they should perhaps introduce this CD here in North Cyprus and even do another album. They have been here 6-7 weeks and are already becoming very popular so what better than their fans being able to have a CD to listen to whenever they want. The duo have a lot of venues lined up already and they said they will also be doing performances for charity a few times a year which will give them the opportunity of giving something back to their new homeland. The Garden Party at Tolga’s Restaurant in Karşiyaka on Thursday 24th October from 2pm and this will be in aid of the Cancer Research Organisation (KAV). This is the first of their charity performances where they will be entertaining for free. Big Al’s in Iskele – Every Saturday night starting this week. We suggested one or two of our local restaurants and when they left us Andrew and Glen called in at Rafters Restaurant and were delighted to report that Abbas had agreed to 2 bookings for them to entertain his customers. So, they will be performing at Rafters Restaurant in Ozankoy on the 30th October and also on New Year’s Eve. Looking forward to 2014, there are already venues booked. 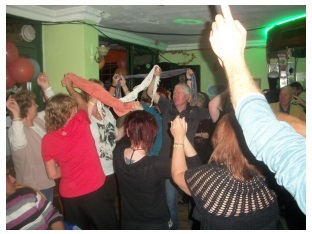 O’Live Bar in Lapta – the last Saturday of every month – from May onwards. The Hut in Lapta – the second Wednesday of every month – from May onwards. Cousins Restaurant in Edremit – Every Tuesday – from May onwards. For all of the restaurants and bars in North Cyprus, here are two new entertainers who will be pleased to talk to you about performing at your venue. They can be contacted by calling 0548 889 3962 or by email on andrew.sings@hotmail.com. 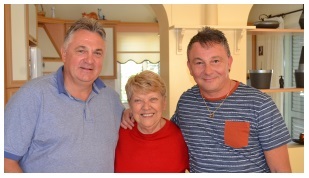 We found both Andrew and Glen to be two really nice, very relaxed and down to earth people, who love what they do and they are now eagerly looking forward to performing in North Cyprus and bringing a lot of pleasure to the residents and tourists alike. We wish them well in their new venture and are sure they are going to be extremely popular and successful. See Andrew and Glen entertaining in the following slideshow.